The Center for Student Progress Summer Bridge program at Youngstown State University was recently awarded a $20,000 grant from the Raymond John Wean Foundation. 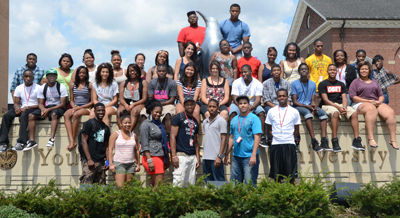 Summer Bridge is a free, one-week residential program for first-time traditional-aged multicultural freshmen entering YSU, said Michael Beverly, senior academic coach in the YSU CSP. He said the grant will be used for student staffing, housing, meals and other supplies for participants during this year’s Summer Bridge week, Sunday, July 24 to Friday, July 29. The program is designed to provide students the opportunity to become more familiar with the academic and social experiences most often encountered by first-year students. During the summer, students reside in YSU residence halls; take introductory writing, Study Skills, and Computer mini courses; participate in presentations from Financial Aid, Student Life, Campus Recreation, Student Employment; take resiliency/conflict resolution courses; and participate in social activities in the city of Youngstown and surrounding communities. Beverly said Summer Bridge transitions to the Bridge and Beyond program during the Fall semester. Bridge and Beyond includes block scheduling of classes, living in a learning community in the residence hall, having a peer mentor, and working with a professional staff member who serves as an academic coach.